should be stored in the dark at a constant temperature, preferably between 12-14°C, for instance, in a cellar. The storage location should not be very humid (relative humidity should be less than 75%) to avoid mold damage to labels and corks. The bottles should be stored lying down to ensure the cork is always in contact with the wine. The temperature at which wine is served has a preponderant role in the perception of its quality. Vinho Verde wines should normally be consumed young. However, wines with a higher alcohol content and which are more complex, particularly Alvarinho, have the potential for very positive aging. If the bottle is at a temperature of 20 ° C, it will require about 2 to 3 hours in a refrigerator to bring the wine to the proper temperature. Alternatively, if the wine is placed in a bucket with ice and water, it will require about 20-30 minutes. But as important as serving wine at the right temperature is, it is also important to keep it at the same temperature, for example with a bucket with ice and water. The process of opening the bottle begins with the cutting of the capsule, which must be done below the outer ring of the bottle mouth. Then clean the top of the cork where impurities can exist. The spiral of the corkscrew should not pass all the way through the cork in order to prevent cork particles or deposits that have formed from falling into the wine. If the cork is difficult to extract, insert the corkscrew diagonally. After removing the stopper, clean the inside of the neck. To open sparkling wine, the capsule should be removed, then open and remove the muzzle or muselet (the metal part that surrounds the cork). Withdraw the cork, holding it firmly and turning the bottle, not the cork, as it could break when twisting it. The pressure inside the container will help to pop out the stopper. The act of shaking the bottle of bubbly and then pulling the cork out will cause a fountain of foam and can celebrate a moment of joy. However, the foam causes a loss of wine without gas with the consequent loss of the wine's most distinguishing feature. Glasses are another key element of wine service. The same wine served in different glasses conveys a different perception of the flavors and aromas. The glass must be colorless and without ornamentation, to allow perception of the color and clarity of wine. It should also have a stem, thus preventing the hand from heating the wine or dirtying the glass. It is also important to allow the wine to come in contact with the air. Bordeaux-style glasses are elegant and suitable for white, rosé and young red wines. The flute - high, narrow and elegant - is ideal for sparkling wine. Whomever opens the bottle should serve himself first, to check the status of wine and, above all, to check that there is no cork residue in the wine. Then serve a little wine (about 1/5 the volume of the glass), swirl well and check if the wine is ready to be consumed by checking for defects, such as cork taint. 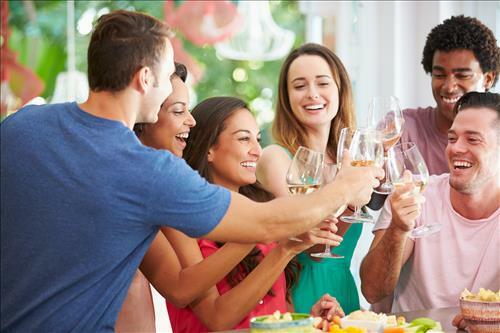 The glasses must not be filled (half a glass is enough) in order to be able to swirl the wine, with a rotary motion, and appreciate its aromas. It is difficult to appreciate a good dry wine if you have drunk a sweet wine prior, so the usual order is dry before sweet, and young before old (in some cases it may be of interest to reverse the order), whit before rosé, and rosé before red. If there is a young and very aromatic wine, it is advisable to first serve the older wine, and only in the end serve the most exuberant wine, which will be the most recently harvested. In the case of wines with good aging potential, you should serve the new wine before the old, because the aged wine is at its peak and may eclipse the younger wine. The ideal is to follow a progression that goes from good to great, from light to full-bodied, and from simple to complex. When the contents of the bottle have not all been consumed, the bottle can be stored, usually for one or two days, in a refrigerator. The bottle must be closed, preferably with a vacuum system to preserve the characteristics of the wine.